With MWC announcements coming fast & furious, I thought I would give you some of the new phones that you might be buying later on this year. And more talk of 5G than you can shake a stick at ! Starting with Sony’s next flagship, the Xperia 1 will arrive as the world’s first smartphone to flaunt a 21:9 Cinema-Wide screen with a 6.5-inch 4K HDR OLED panel. The phone will sport a 30 percent larger display area as compared to its predecessor, the Xperia XZ3. The screen is powered by Sony’s BRAVIA X1 mobile engine that produces deeper black and more natural colours. 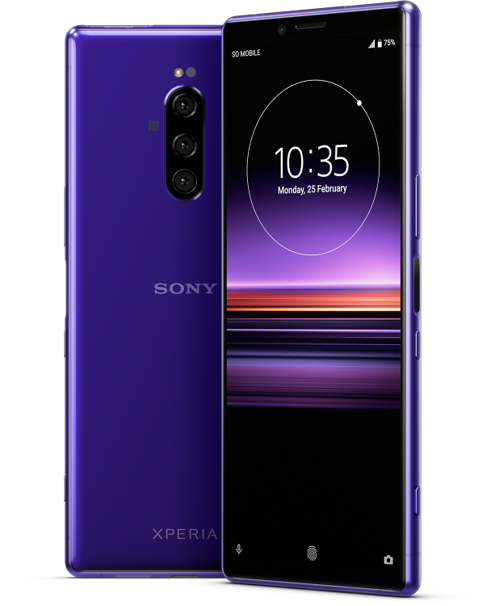 Design-wise, the Xperia 1 will sport a metal and glass sandwich design with a layer of Corning’s Gorilla Glass 6 at both the front and rear. Similar to the earlier Sony flagships, the new offering will also offer IP68-certified water and dust-resistant design. The fingerprint sensor of the handset will be placed on the right side. Notably, the Sony Xperia 1 will come as the Japanese tech giant’s first smartphone with a triple camera at the rear. The flagship sports three 12-megapixel shooters at the rear. One of them is a normal lens, while the other two include a super wide-angle lens and a telephoto lens with optical image stabilisation. The smartphone will be capable of recording 4K HDR videos in 21:9 cinema format. Notably, the will be a new Cinema Proapp on board to let you shoot professional videos. There will be support for super slow-motion video recording at full HD resolution, and option to save recorded photos in the RAW format. The smartphone will also feature the new Dual-Pixel technology, which is touted to capture quality photos of moving objects even under low-light conditions. For selfies, the handset gets an 8-megapixel shooter, which will also let you create 3D avatars of yourself using the 3D Creator feature. Moving on to the other features, the Sony Xperia 1 will be powered by Qualcomm’s latest top-of-the-line Snapdragon 855 processor, and boots Android 9 Pie out of the box. The smartphone will get 6GB of RAM and 128GB of storage, which can be further increased up to 512GB by inserting a microSD card. In terms of connectivity, the handset will offer 4G LTE, dual-SIM slots, and a USB Type-C port. A 3,300mAh battery with fast charging support will complete the specifications of the smartphone. Moving on the Xperia 10, we’ve learned that the smartphone features a 6-inch full HD+ display with an aspect ratio of 21:9 and boots Android 9 Pie out of the box. This one will be powered by Qualcomm’s octa-core Snapdragon 630 processor, aided by 3GB of RAM. The smartphone will offer 64GB of storage, further expandable up to 512GB thanks to the microSD card slot. At the rear, the handset will feature a 13-megapixel primary shooter, aided by a 5-megapixel secondary camera. This one also supports video recording in 21:9 format and bokeh photography. For selfies, the device gets an 8-megapixel shooter. A 2,870mAh battery will keep the whole package alive. As for the Sony Xperia 10 Plus, the smartphone will offer a bigger 6.5-inch 21:9 display with full HD+ resolution. This one will be powered by a Qualcomm Snapdragon 636 processor, and come with 4GB of RAM and 64GB of expandable storage. In the optics department, the handset will sport a dual 12-megapixel + 8-megapixel camera setup at the rear with double optical zoom and bokeh effects. For selfies, the device will feature an 8-megapixel camera. This smartphone will be packed with a 3,000mAh battery. Both the Xperia 10 and 10 Plus come with side-mounted fingerprint sensors. The Sony Xperia L3 will be the most affordable of the lot. The phone gets a side-mounted fingerprint sensor and offers the older 18:9 aspect ratio. The device will feature a 5.7-inch HD+ display and boot the dated Android Oreo. Powering the smartphone will be a MediaTek 6762 processor, aided by 3GB of RAM. In the camera department, the handset features a dual 13-megapixel + 2-megapixel rear camera setup and an 8-megapixel front camera. A 3,300mAh battery completes the list of the specifications. Folding phones, not sure I'm keen but they look pretty cool! The Pureview looks interesting alright and Huawei folding phones look the best but they are too expensive at the moment.